Webvault offsite backup is suitable for small and large amounts of data. However if you have an amount of data that is larger than say 20 or 30GB+ you may prefer to perform a seed load. Seed-loading involves manually performing your first backup procedure onto a physical USB hard disk drive or other portable media device. You can then send it to our data centre and we will import your data onto our backup storage servers for you. The advantage of seed-loading is that it will decrease the time it takes to backup your files the first time around, and it may also save on internet bandwidth costs if your internet service provider charges you for data uploads. The disadvantage of performing a seed-load however is that it is a manual process and requires time or effort from yourself or your IT professional. If you have a fairly fast internet connection, you may be content to allow the initial backup to take place over the course of a few days or 1 week. Setting start and stop times for your backup schedule, will ensure that the initial backup only runs during off-peak hours when it will not affect your internet connection. NOTE: Stop time schedules are not available for some backup set types, such as Microsoft Exchange or SQL Server. 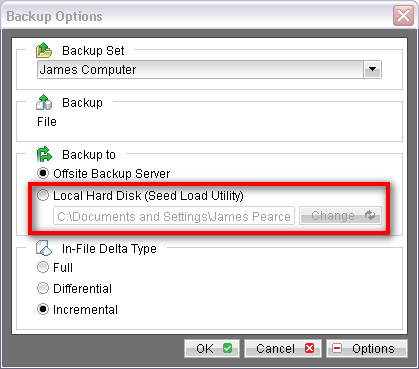 These backup set types are more commonly seed-loaded than regular file type backups. $0 if providing your own USB storage device and you cover the costs of transport to and from our data centres. $110 our technicians will perform the seed-load for you at your business premises. 1. 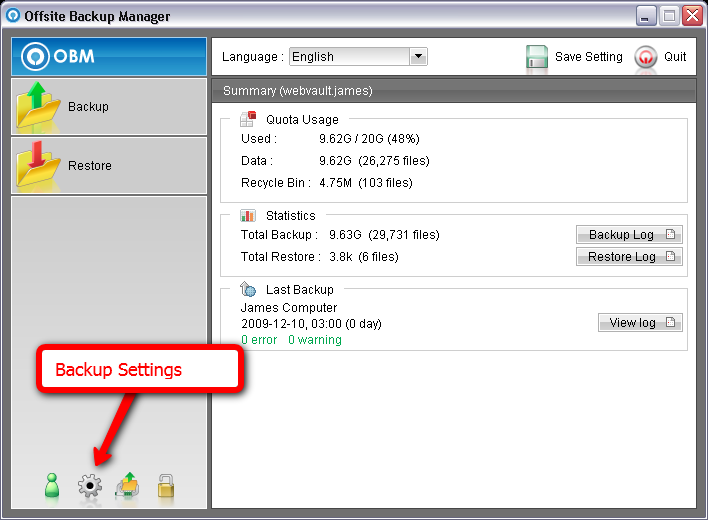 To perform a seed-load, first install the offsite backup manager software on your computer or server and then create your backup set, saving your settings to the offsite backup server. Please refer to the following articles on how to setup your offsite backup software. 2. Temporarily disable any automated backup schedules for the particular backup set, to ensure that no files are uploaded prior to our technicians completing your seed-loading process at our data centre. To disable your backup schedules, click on the backup settings button, choose the correct backup set from the drop down box at the top, and then click on Backup Schedules. Un-Tick the schedules option as shown. Save your settings to the backup server. 3. 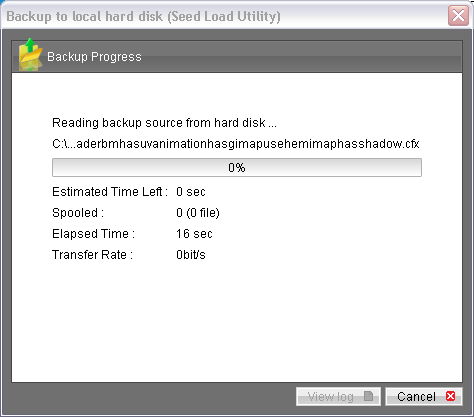 Perform your seed-load backup procedure by clicking on the Backup option from the main menu screen. 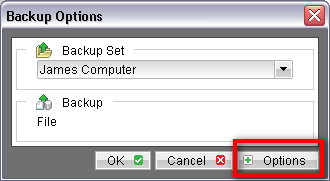 Choose the correct backup set from the drop down list. Click on the Options button. Select the Local Hard Disk (Seed Load Utility) option. Click the Change button to choose the correct drive and path of your USB or portable storage media device. Click OK and a full copy of your backup file source will now be performed to your storage media device. NOTE: Seed-loaded data is encrypted using your regular offsite backup encryption settings. This ensures that your data is fully protected while in transit to our data centres. 4. After the backup process has completed, close the backup software, unplug your portable storage media correctly and send it to the appropriate secure data centre facility listed below. Before sending us your device, you MUST contact our customer support team with your backup account username so that we can advise the data centre staff on how to receive your storage device. Our support team will advise you on the correct data centre address for your backup. 5. After we have completed the seed-loading procedure at our data centre, we will advise you that you can commence automated scheduled backups of your data. 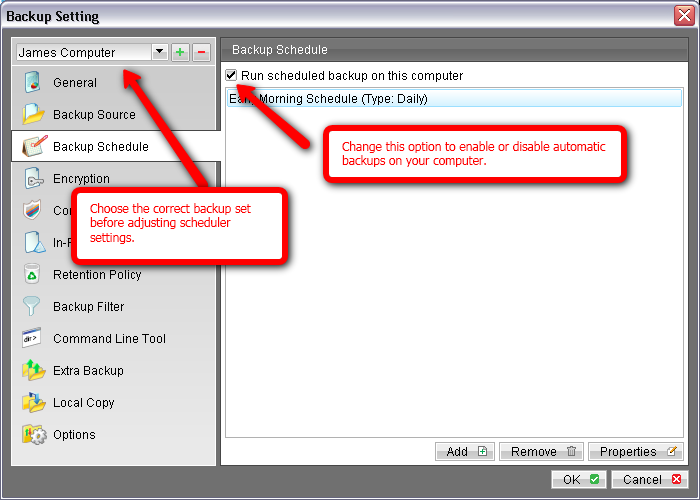 Re-enable your scheduled backups as described in Step 2. You must correctly pack and deliver your hard disk to the correct data centre as advised by our support staff. If sending your hard disk by courier, please carefully wrap or pack your storage device in a box or bag with suitable protective padding. Your box or storage device must be carefully labelled and sent to one of the following data centres. If you are using the older version of our Offsite Backup Manager software, or if you are running on a Microsoft Windows 95 or 98 operating platform, please download the following PDF guide for seed-loading your data. Webvault is NOT responsible for lost or damaged storage media devices while in transit to or from our data centres.